What made Frank Sinatra songs so incredibly unique and memorable? He preferred more difficult songs. He recorded songs that no one else recorded, or that few others attempted to record. He liked unique songs, power songs, songs with a punch, songs with a slam of truth that other songs lacked. His unique style quickly made the song his own, and made the song yours. His phrasing of the lyrics (words) to a song gave a new meaning to the words, and a depth of nuance that was hard to match. He recorded songs that some would consider ordinary, or borderline songs - songs that you might take or leave, and did a masterful job with them. Some of these songs weren't much without the voice - "Mrs. Robinson" was one of them. It Was a Very Good Year" was another. Not every voice could have mastered these songs and made them sound so one-of-a-kind and believable. 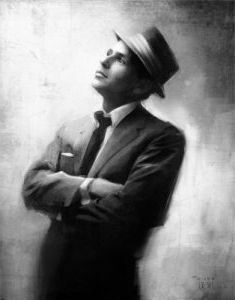 Just below is an incredible rendition of "My Way" sung by two of the most phenomenal singers ever - Frank Sinatra, the Crooner, and Luciano Pavorotti, the riveting operatic master. Listen for some inspiration! Click here for more characteristics of Frank Sinatra songs. Frank Sinatra's music stands in a class by itself. No singer/artist before or since has a signature anything like that of Sinatra's. You might say that Frank became famous by going "against the grain" - he took risks, and did what few singers were willing to do. And boy, did it pay off! He took risks and differentiated himself from your everyday, run of the mill singer. This gave him a unique message and a much-loved reputation. Well done, Mr. Sinatra!